With a multi state plan, can I go out of state for a procedure that is covered in that state but not my home state. For example, bariatric surgery is not covered in CT but is covered in NY…can I go to NY to get it done with a multi state plan? A multi-state plan is only meant for competition (especially in areas where only one provider would be available), and does not necessarily mean that you have coverage in multiple states. You need to check to see if your current plan offers regional or nationwide coverage;a s well as, if your plan will offer different coverage for certain care in different states than what is covered in your residency state. Reach out to one of Medicoverage licensed independent insurance agents during Obamacare’s Open Enrollment to find out if there are plans that allow you to have a nationwide network, by calling 800-930-7956. We live in CA but our son is in college in NM. His university no longer offers student health insurance but he doesn’t qualify for NM insurance because he’s not a resident. I was thinking if I enrolled into the Anthem Multistate that that would cover him. So students going to college outside their home state are just screwed? He should qualify for a Blue Shield or Anthem PPO with BlueCard plan that offers nationwide coverage. If he does not, there are other options we can help him with. Click here to get an Obamacare quote in your area. Please call us at 800-930-7956 and we can help your son find a plan. I currently have a multi state plan because I thought I needed it to see providers in the bordering state. I am thinking I do not need a multi state plan. If a provider is listed as in network with the insurance company but is located in a different state than where I purchase insurance will it be covered as in network. Example I have BCBSNM and the provider is located in Texas but listed as an in network provided on BCBSNM website. Multi-state plans do not necessarily mean that you are covered in multiple states, as multi-state plans were created as competition. Now, for your particular situation, you’ll want to contact your provider (number is on the back of your insurance card) to see if you are covered outside of your area. If your plan does not cover you in your bordering state, and you would like help finding a plan that covers you in multiple states, please call us 800-930-7956. I am planning on moving in a couple of months from Md. To Pa. Can I keep my insurance? My husband and I will still be working in Md. I want to keep my doctors. I know that people come from other states like Va. And De. to MD for their doctors. Thank you for your question. Most people need to enroll in a health plan in the state that they pay taxes in. Therefore, more than likely you’ll need to enroll in a plan in PA. This doesn’t mean you’ll lose your doctors, though. If you join a PPO plan that offers regional or nationwide coverage, many times doctors outside of your area are considered in network. Hope this helps. Is there any reason to NOT choose a multi-state plan? Many people, at one time or another, travel out of their home state for vacation, visiting relatives, a wedding, ...and so forth. Covered services appear to be the same, so I don’t see a down side to multi state plans. Thank you for your question. The confusion with these plans is the name. While a multi-state plan may cover you in more than one state, most will not. These plans are set up to offer competition to the plans in the state exchange. Remember that all health plans must offer emergency healthcare at in-network costs no matter where you are in the U.S. With that said, the best way to choose a plan is to look over the network, cost for services, and monthly premium. Please call 800-930-7956 if you have any further questions. The information that I received from BCBS of South Carolina was that if a provider was in their national EPO network (be careful to restrict the search to their EPO) then you would be covered for medical treatments from that provider. I reside in both WI and CA will I be covered in both states? Thank you for your question. 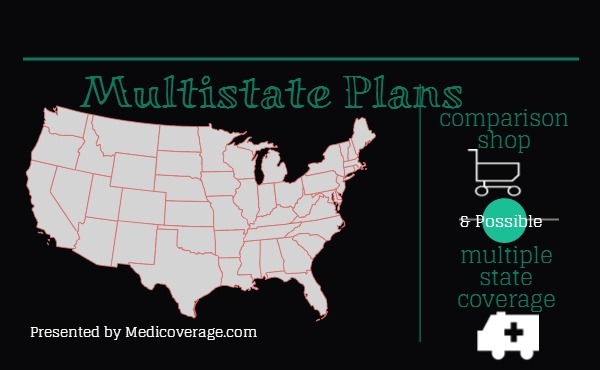 There has been so much confusion about Multi-state plans and how they work. Call 800-930-7956 and we can work together to learn which plans may be available in your area. It seems the multi-state coverage is the source of a lot of confusion. I travel out of state a couple of times a year for chronic disease management, so I wanted to make sure those appointments would be covered. I called Anthem and specifically asked about Multi-State plans, and I think they are more confused than anyone. Anthem says that Multi-State only applies in case of emergencies (ie: car accident, getting shot, etc), but not for regular doctor appointments. I knew that couldn’t be correct, so I spoke with someone at Healthcare.gov and they said the opposite, that if a Multi-State plan is offered and the doctor is in-network, than it would be covered. That’s the answer I need! However, I’m still confused as to what is and isn’t covered! Thanks for your comment. We have had the same frustrating experience dealing with Multi-State plans. We keep getting conflicting answers as well. Please let us know if you get a concrete answer, as we will update our page accordingly.